Grilled Carrot Salad with Brown Butter Vinaigrette Recipe | Happy Deal - Happy Day! Grilled food always tastes delicious, no matter what you cook on the smoker. But, for most people, grilling is a task that only involves meat, which is not right. Vegetables and fruits can also be thrown onto the grill. Grilled vegetables and fruits look good and taste as delicious as meaty delights. 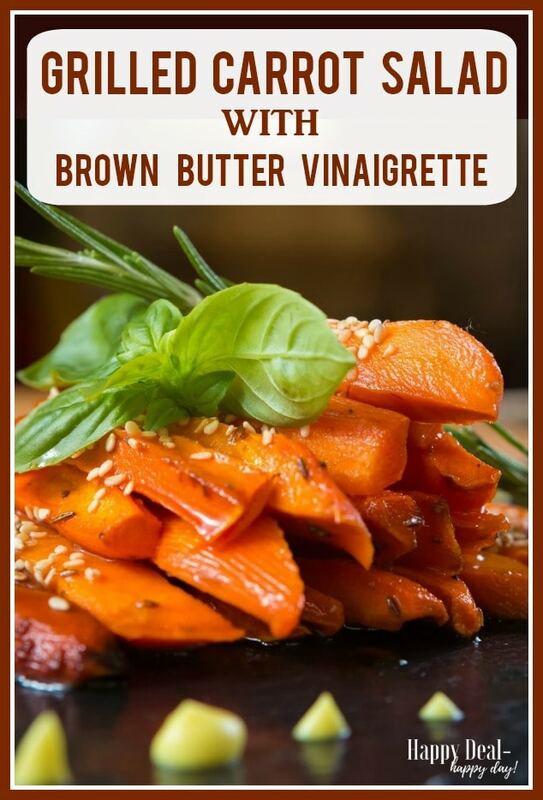 Today I’m going to show you how to make Grilled Carrot Salad with Brown Butter Vinaigrette! But, what gives grilled vegetables and fruits an edge over grilled meat is the fact that there is hardly any fat or cholesterol in grilled vegetables and fruits. You can grill vegetables and fruits in an electric smoker or a pellet smoker, as both will provide you with a great taste at the end. The recipe we are going to discuss today is going to be a vegetarian recipe that consists of carrots, coriander, dry fruits and other nutritious ingredients. 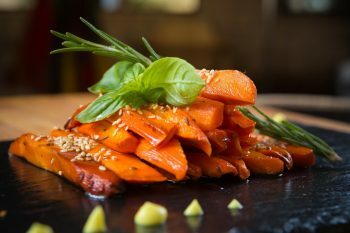 Recipe’s name is ‘Grilled Carrot Salad With Brown Butter Vinaigrette’. 1. 1 lb baby carrots, tops trimmed and cut in half lengthwise. 2. 2 tbsps., sherry vinegar. 3. 1 tbsp., ground coriander. 4. 1 tbsp., ground fennel. 6. ½ cup extra-virgin olive oil. 7. 2 tbsps., Marcona almonds + chopped almonds (for garnishing). 8. 2 tbsps., smoked sweet paprika. 10. 2 garlic cloves, thinly sliced. 11. 4 tbsps., unsalted butter. 12. 5 oz., baby arugula. 13. Salt and freshly ground pepper. 1. Begin the process by adding olive oil, garlic, coriander, fennel and thyme in a bowl. Mix all the ingredients and then, add carrots into the mixture. Leave it for two hours. 2. Preheat the grill pan. Take out the carrots of the bowl where they have been marinated. Season the carrots with salt and pepper followed by putting them on the grill. Grill the carrots for 6 minutes, turning the sides in between. When carrots become crisp and tender, transfer them to a bowl. 3. By the time, the carrots are being grilled, take a small skillet, cook the butter over medium heat. When butter turns light brown and nutty-smelling, shake the pan gently. It will take about 5 minutes to cook the butter. Now, scrape the butter and solids into a blender followed by adding water, vinegar and two tablespoons of almonds. Blend the mixture until you get a smooth puree. Season the vinaigrette with salt and pepper. 4. It’s time to add arugula and vinaigrette to the carrots. Make sure that the coating covers the carrots properly. 5. Add the salad to a plate and sprinkle some chopped almonds at the top. Begin the process by adding olive oil, garlic, coriander, fennel and thyme in a bowl. Mix all the ingredients and then, add carrots into the mixture. Leave it for two hours. Preheat the grill pan. Take out the carrots of the bowl where they have been marinated. Season the carrots with salt and pepper followed by putting them on the grill. Grill the carrots for 6 minutes, turning the sides in between. When carrots become crisp and tender, transfer them to a bowl. By the time, the carrots are being grilled, take a small skillet, cook the butter over medium heat. When butter turns light brown and nutty-smelling, shake the pan gently. It will take about 5 minutes to cook the butter. Now, scrape the butter and solids into a blender followed by adding water, vinegar and two tablespoons of almonds. Blend the mixture until you get a smooth puree. Season the vinaigrette with salt and pepper. It’s time to add arugula and vinaigrette to the carrots. Make sure that the coating covers the carrots properly. Add the salad to a plate and sprinkle some chopped almonds at the top. Author Bio: Monica Henin, the author of this amazing grilled salad post is a food expert. She has been writing blogs and articles on healthy recipes and food tips for quite some time now. Check out the best of her work at Addonkitchen.com. ← Amazon: Washi Tape Glitter Masking Tape, 50 rolls for $6.99 – Normally $14!